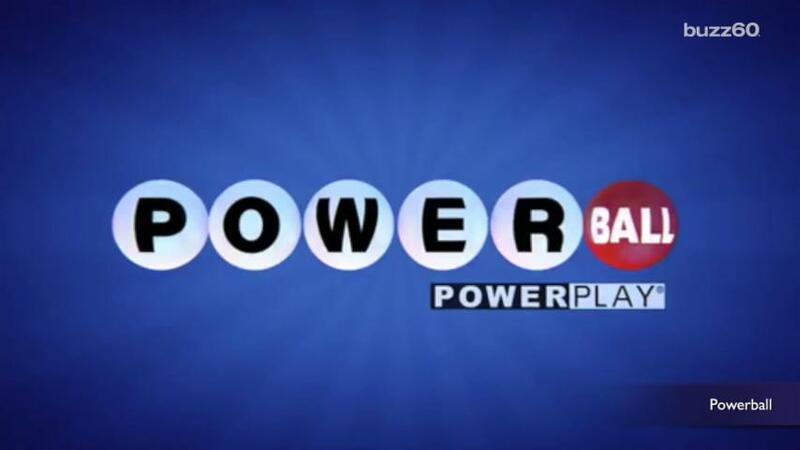 The Powerball lottery drawing for Saturday evening has an estimated jackpot prize of $415 million. While that's a huge amount of money, buying a ticket is still probably a losing proposition. When trying to evaluate the outcome of a risky, probabilistic event like the lottery, one of the first things to look at is "expected value." The expected value of a randomly decided process is found by taking all of the possible outcomes of the process, multiplying each outcome by its probability, and adding all of these numbers up. This gives us a long-run average value for our random process. Expected value is helpful for assessing gambling outcomes. If my expected value for playing the game, based on the cost of playing and the probabilities of winning different prizes, is positive, then in the long run the game will make me money. If expected value is negative, then this game is a net loser for me. Powerball and similar lotteries are a wonderful example of this kind of random process. As of October 2015 in Powerball, five white balls are drawn from a drum with 69 balls, and one red ball is drawn from a drum with 26 balls. Prizes are then given out based on how many of a player's chosen numbers match the numbers written on the balls. Match all five white balls and the red Powerball, and you win the jackpot. In addition, there are several smaller prizes won for matching some subset of the drawn numbers. Already, we are in trouble. Given the overwhelming likelihood — a 96% probability — that we wind up matching absolutely nothing and therefore wind up just throwing our $2 out the window, our expected value ends up being $0.26 in the red. We would need a prize of around $500 million to get a positive expected value. 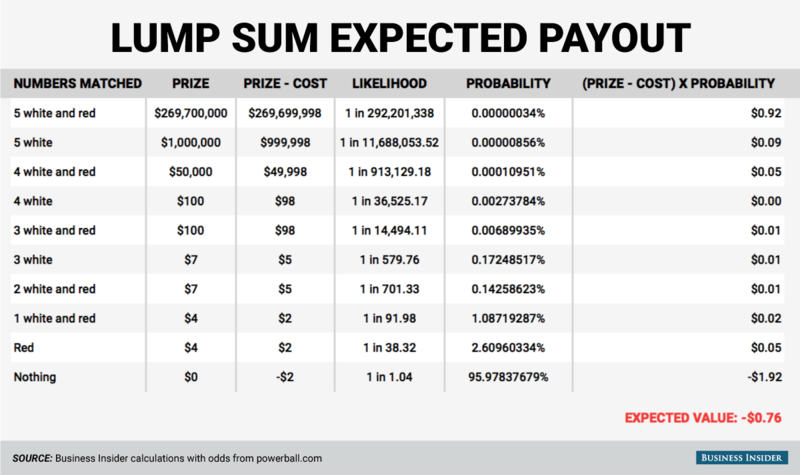 Of course, even that scenario with a $500 million prize and a positive expected value is a vast oversimplification. 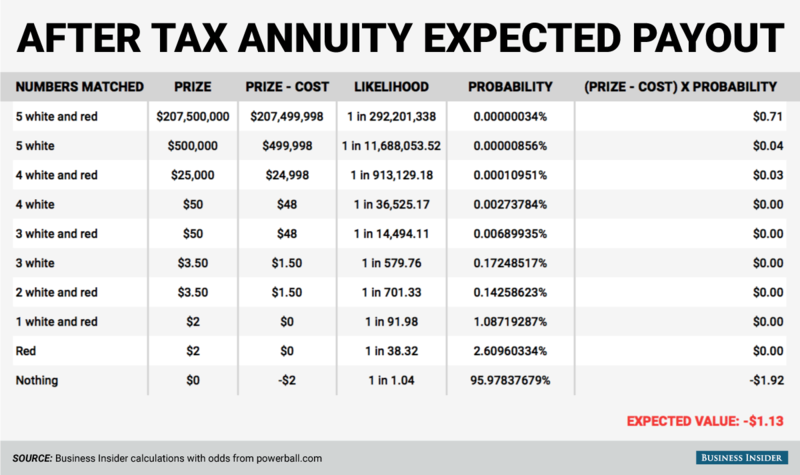 First, the headline $415 million grand prize is paid out as an annuity: Rather than getting the whole amount all at once, you get the $415 million spread out in smaller — but still multimillion-dollar — annual payments over the course of 30 years. If you choose to take the entire cash prize at one time instead, you get much less money up front: The cash payout value at the time of writing is $269.7 million. The question of whether to take the annuity or the cash is somewhat nuanced. 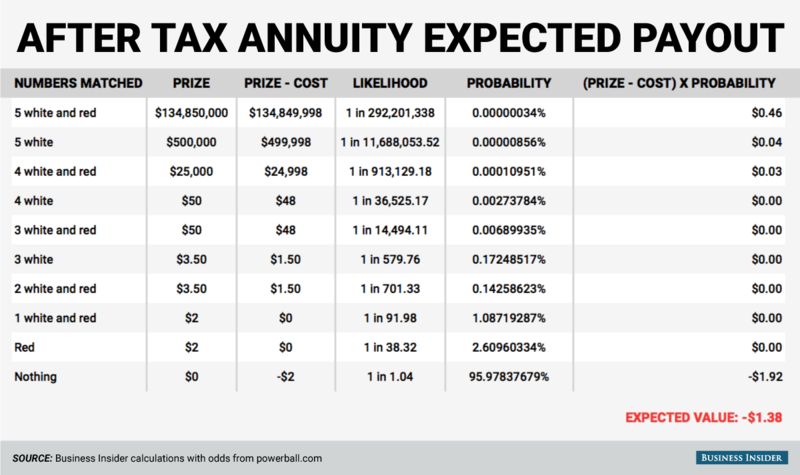 Powerball points out on their FAQ site that in the case of the annuity, the state lottery commission invests the cash sum tax-free, and you only pay taxes as you receive your annual payments, whereas with the cash payment, you have to pay the entirety of taxes all at once. On the other hand, the state is investing the cash somewhat conservatively, in a mix of various US government and agency securities. It's quite possible, although risky, to get a larger return on the cash sum if it's invested wisely. Further, having more money today is frequently better than taking in money over a long period of time, since a larger investment today will accumulate compound interest more quickly than smaller investments made over time. This is referred to as the "time value of money." 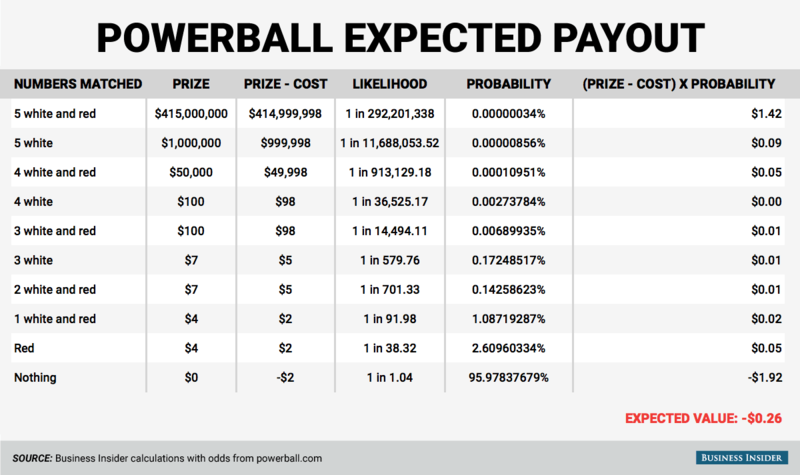 When you consider the expected value of a Powerball ticket, you can see that the lottery is a pretty bad "investment."